Submit your picture to stand up for health care, not harassment. The White House needs to address McCullen. The feminist ethics of make-up are endlessly complicated but our love for Jenny Slate is not. The Senate HELP committee held a hearing on campus sexual violence yesterday. 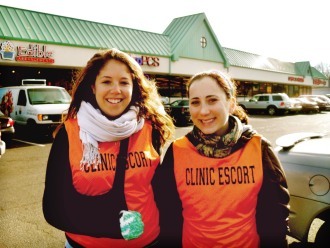 Abortion clinics are a dangerous place for staffers and patients. As Vicki Saporta told the Huffington Post,”[s]ince 1977, there have been 8 murders, 17 attempted murders, 42 bombings, 181 arsons, and thousands of incidents of criminal activities.” You wouldn’t know that, though, from yesterday’s Supreme Court decision McCullen v. Coakley. Maya wrote yesterday that the dangerous, disappointing McCullen struck down Massachusetts’ “buffer zone” law. Buffer zones were set up to protect people entering abortion clinics for services or work against violence and harassment — but Chief Justice Roberts, writing for the majority, elides these threats and re-imagines the anti-choice protester as a grinning granny with some good advice.